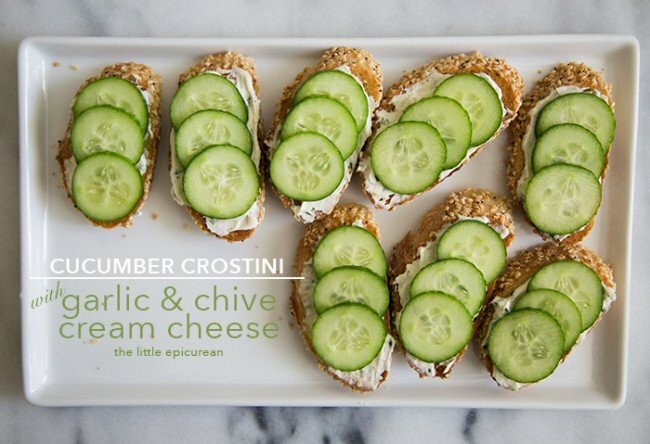 One year in college I was addicted to cucumber tea sandwiches: sliced cucumbers on top of toast smothered in cream cheese. I ate it ALL THE TIME, until one day I got sick of it. I banished it from my diet, until now. I’ve revamped that sandwich into something that I can ever tire of. I’ve taken cream cheese and made it better (if that’s possible, because I think cream cheese is already near close to perfect). 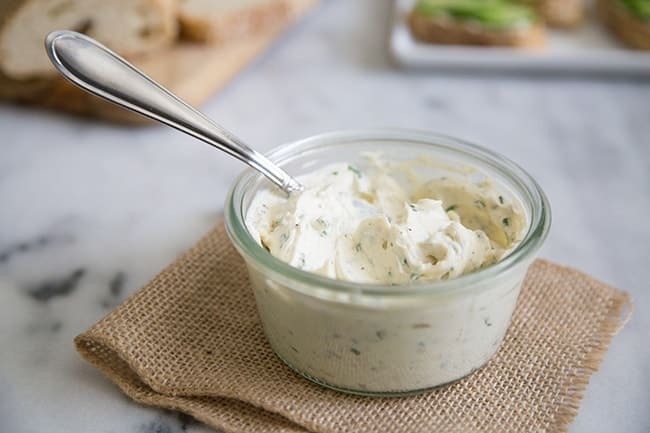 With the help of garlic power and fresh chives, I whipped up a cream cheese spread that is addictingly rich and at the same refreshing. Long gone are my days of eating Wonder Bread and crustless bread. I’ve graduated from plain old toast. I’ve moved on to seeded baguettes. I love the assortment of baguettes available at Trader Joe’s. I feel fancy whenever I buy them. When I leave the store with my canvas tote full of groceries (and a nice $5 bouquet of flower peeking out) and a baguette under my arm, I like to daydream for the one minute or so it takes me walk to my car. During that brief moment, I like to imagine that I’m in Paris walking to my gorgeous apartment in the Rive Gauche (left bank). Don’t laugh. It’s little things like that make grocery shopping days a little more fun. Unlike the prepackaged version, this doesn’t last forever in the fridge. The fresh chives give it a shelf life of about a week. Although, I assure you, you will finish it before then. I’ve been finding any sort of food to serve as a vehicle to eat this spread with. Be it sliced cucumbers, carrot sticks or potato chips, I’ll eat it. I just don’t want Alex to walk into the kitchen and see me eating cream cheese with a spoon. That would just be way too embarrassing and unforgettable. Slice baguette. Place on a baking sheet. Drizzle with a little olive oil. Broil in the oven for about 15-20 seconds on each side until its lightly golden. 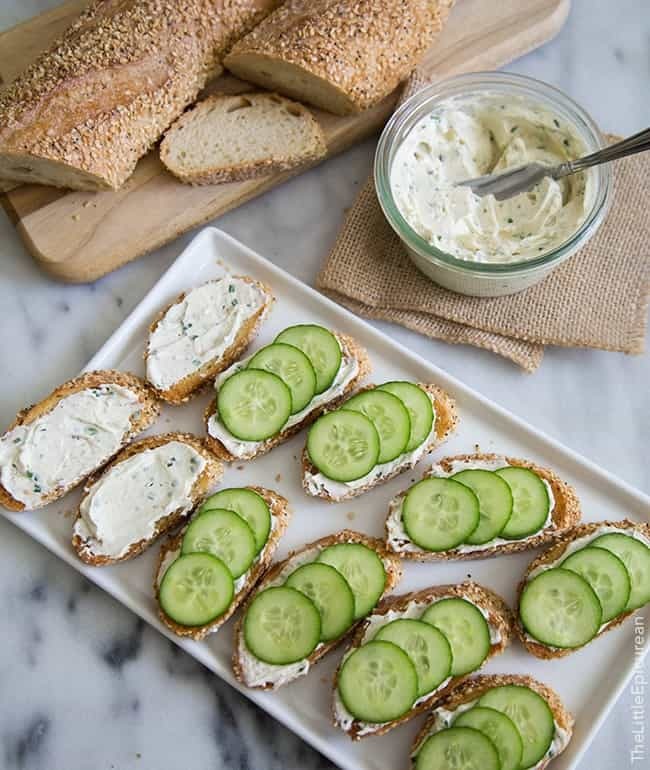 Spread on the garlic and chive cream cheese. Neatly arrange sliced cucumbers on top and enjoy! This cream cheese spread is also fabulous and recommended on turkey sandwiches in place of mayo. Alex used it to make himself a chicken salad sandwich. I also tried it with a roast beef sandwich instead of horseradish (simply because I didn’t have any), and it was also amazing. 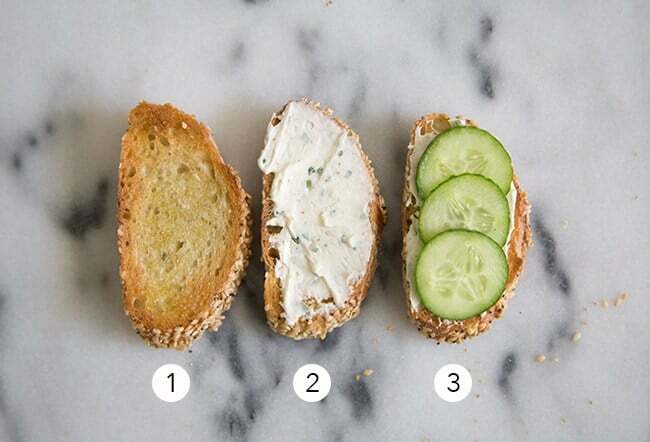 Do your bread a favor and give it a little garlic and chive cream cheese love. 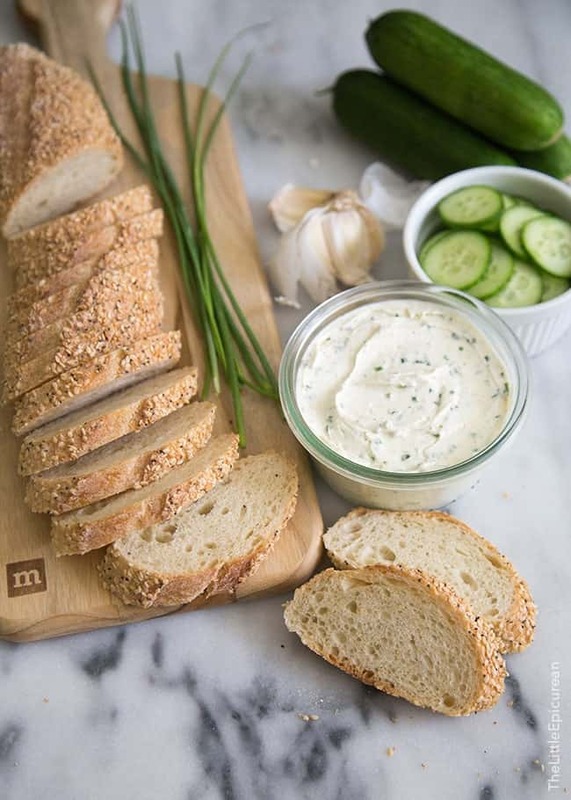 Do your bread a favor and give it a little garlic and chive cream cheese love. It's great on turkey sandwiches or chicken salad sandwiches in place of mayo! In the bowl of a stand mixer fitted with a paddle attachment, beat cream cream until smooth. Add chopped chives, garlic powder, and black pepper. Mix until fully incorporated. Scrape down bowl as needed to ensure thorough mixing. Transfer cream cheese spread into an airtight container and keep stored in the fridge. My husband is going to love this. I can see putitng this on everything!